Landscape of the Mind is the wonderful work of Kate Hopkinson who also created a profile of my mind. After all, I not only LOVE complex systems but also break them down to ‘simple solutions’. I will never know whether I could have developed 3D Metrics if I had not ‘looked at myself’ as often as I have. And thus I’ve always been fascinated by all interactions between inner and outer worlds – as the only way to make sense of what we are experiencing. Landscape of the Mind will help anybody towards identifying their unique strengths and weaknesses and thus improve the abilities of themselves and their teams. 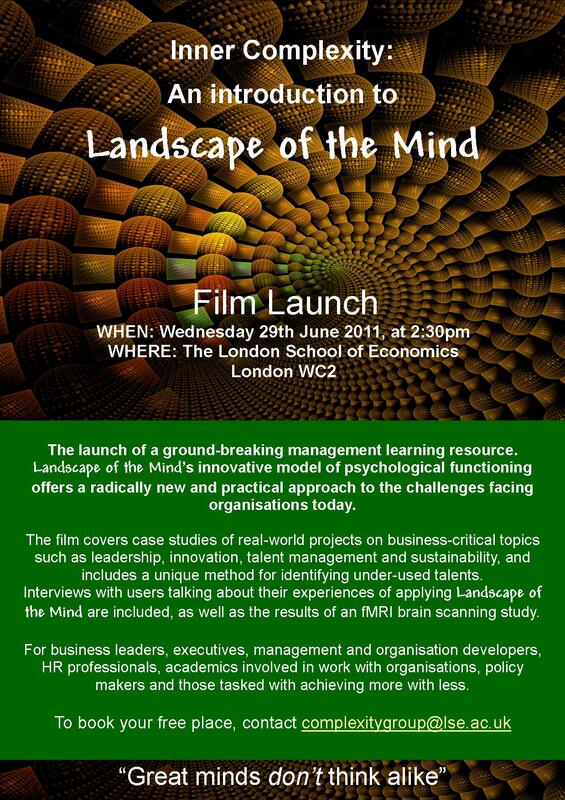 I wish I could attend the launch on 29th June at 2.30 in the London School of Economics. This entry was posted in Complex Systems, Conference, Feeling, Lecture and tagged art, Business, Complex systems, Events, London School of Economics, Mind, Research Groups, Thought, Zen. Bookmark the permalink.